PROVO, Utah – February 27, 2019 – Action Target Inc., the leading manufacturer of modern shooting ranges, steel targets, range services and supplies, announces a new organizational structure to optimize business operations and provide increased focus on customer support and aftermarket services. Las Vegas, NV –– Glock received the Action Target safety award for the highest standard of safety during the shooting 2019 Industry Day at the Range event held on January 21st at the Boulder Rifle and Pistol Range in Boulder City, Nevada. The Action Target Safety Award was created to acknowledge the Industry Day at the Range exhibitor that fostered the highest level of firearms safety during the shooting event. Safety auditors judged each of the shooting exhibitors. The score was determined by basic safety criteria such as providing hearing and eye protection, control of ammo and safe handling of firearms on the firing line. The score card also gave points for higher levels of safety such as posted rules, first aid kit at shooting station, shooting coach at station, etc. More than 90 Industry Day exhibitors were judged on their firearms safety practices by safety auditors. Glock was awarded the Action Target Safety Award at Action Target’s SHOT Show booth (#14568) and has been the target sponsor for this range day event going back 17 years. Glock is celebrating 30 years of Perfection, a simple evolution of time introduced to the U.S. market in the 1980s, GLOCK is proud to continue its journey and celebrate 30 years of quality, commitment, design and innovation in the U.S. “We have supported Industry Day at the Range for many years, and we’re excited to receive this award,” says Ed Fitzgerald, special projects manager for Glock. “Safety is our focus and we always ask others how to do even better,” he says. The fourteenth annual SHOT Show Industry Day at the Range took place on Monday, January 21, 2019. With more than 1100 members of the media and nearly 700 buyers and dealers in attendance, Industry Day continues to be the largest hands-on media event in the hunting and shooting industry, held anywhere in the world. Attached photo, left to right: Ed Fitzgerald, Special Projects Manager; Mike Birch, President and CEO, Action Target; Ryan Allen, District Manager (LE); Ashley Rhuark, Shooting Team Glock; Larry Ford, Law Enforcement District Manager. PROVO, UTAH – January 17, 2019 – Action Target Inc., the leading manufacturer of modern shooting ranges, has announced innovative shooting range technology to be displayed at SHOT Show 2019. Visit the Action Target booth #14568 at SHOT Show 2019 for live, hands-on demonstrations. “At Action Target, we are unrelenting in our drive to challenge the status quo and redefine the shooting range industry through continued innovation and foresight. We are excited to display a strategic expansion of Action Target’s product line at SHOT Show this year. New products include the most sophisticated retriever on the market, an advanced rubber berm trap, tablet-controlled targets, and a new lead containment system. Security systems, a metals recycling program and other aftermarket services have also been implemented recently, reinforcing Action Target’s position as the only true turnkey solution provider in the industry,” said Michael Birch, CEO at Action Target. Action Target’s Genesis is the most advanced target retriever available. It was developed to streamline system control, revolutionize the shooter’s experience, and reduce maintenance. Genesis utilizes Action Target’s Strike Watch™, a patent-pending software that detects bullet strikes to the target carrier. Genesis also integrates with SmartRange Axis™, Action Target’s new range control system. This allows ranges to apply unique permissions to each lane, create and store shooting programs, manage lane time, and run synchronized trainings across multiple lanes. To enhance the shooter’s experience, Genesis offers a large selection of challenging programs for basic, intermediate, advanced and professional shooters. When developing these programs and the user interface, Action Target incorporated extensive feedback from shooters of all skill levels to guarantee optimal satisfaction and ease-of-use. Other features include the ability to turn targets 360 degrees, which allows for dynamic target presentations, including teasing, spinning and timed exposures. An integrated camera displays the target on the control screen, eliminating the need to bring the target up range for assessment. Furthermore, multiple lighting options and variable target carrier speeds (up to 15 feet per second) provide a highly customizable training environment. For improved performance and reduced maintenance, the Genesis target carrier is both wireless and encased in heavy-duty armor. In addition, the recessed target clamp avoids damage from bullet strikes. “The launch of Genesis is a monumental step forward in revolutionizing the shooter’s experience. From beginners to experienced law enforcement personnel, Genesis engages, challenges and thrills users of all levels. Our state-of-the-art technology also provides range owners with data that allows them to optimize range operations and strengthen customer interaction,” said Kevin Tomaszewski, VP of Marketing and Engineering at Action Target. “Genesis is the culmination of years of customer input and market research and we are proud to provide the most innovative and dynamic target retriever system on the market. We look forward to sharing future innovations that will continue to delight shooters and bolster the success of our customers,” said Jesse Nelson, Product Marketing Manager at Action Target. Action Target will display a new design of the Rubber Berm Trap. This advanced modular trap adheres to the strictest building codes and may be free-standing or wall-mounted. Its patented features allow for simple maintenance and servicing. The rubber can also be treated with a Class A fire retardant that is free of harsh chemicals, curing agents and pungent odors. This fast-drying fire retardant may be easily applied with a standard paint sprayer. The Rubber Berm Metals Recycling Program is the simplest and most beneficial method for recycling spent metals from rubber berm traps. Members of this program may opt to earn a check for 100% of the value of the recycled metals or Action Target STORE credit (with an additional 10% bonus) to purchase range supplies, targets and ammunition. This credit may also be applied toward Action Target range maintenance services. Action Target provides program members with documentation to verify compliance with OSHA and EPA regulations. Action Target combines all security solutions into one easy-to-use system. Video confirmation and two-way audio prevent incidents and reduce false alarms to less than 1%. This significantly contrasts the industry-average false alarm rate of 90%. Trained security professionals review alerts 24/7 and the system’s advanced video analytics feature an algorithm that is unmatched in the industry to provide accurate threat assessment. Furthermore, range owners may access the system, view live video and arm/disarm the system from anywhere via mobile device. “Our security solutions provide ranges the with the highest level of confidence. By integrating cutting-edge technology and industry-leading hardware we are able to provide a tailored solution that is unmatched in the industry,” said Jesse Nelson, Product Marketing Manager at Action Target. The Fixed Turning Target Stand (FTTS) is an ideal system for tactical training and shoot/no shoot scenarios. The electric version of the FTTS features full 360-degree target rotation as well as quiet functionality, making it difficult for shooters to anticipate when the target will turn. This year, the ground-mounted electric version of the FTTS includes optional on-board LED lighting. Red, white and blue strobes illuminate the target to enhance the authenticity of law enforcement training scenarios. Furthermore, the turner has an all-weather design, making it possible to train in all climates. The features and functionality of Action Target’s Smart Range™ and Master Control™ may now be accessed via mobile device. This allows instructors to join shooters on the firing line during training while controlling target behavior. Additionally, Action Target’s wireless network system is designed specifically for each range and is completely independent of other on-site networks. In 2017, Action Target launched AutoTargets™, the revolutionary and highly portable reactive target system. Recently, two new AutoTargets enhancements have been developed to enhance law enforcement and military training. The first is a new adapter kit that allows single-zone hit sensing on plastic E and F-type military silhouettes available from the Action Target STORE. These reactive targets will present and fall in less than one second and can record consecutive hits at up to 900 shots per minute. Approved ammunition includes calibers from .22LR to NATO cartridge sizes. Each target can be independently programmed to fall after a programmed time limit or a predetermined number of bullet strikes. AutoTargets is rated for any temperature between 0°F and 120°F and may withstand winds up to 25 mph. The second is a revolutionary software for building advanced courses of fire. Originally designed for shoot house applications, this software has been expanded and enables instructors to program target presentation sequences and target knock-down requirements. It also allows users to generate valuable after-action summaries to improve training at the range. Furthermore, unique floor plans, images and maps can be uploaded to help instructors visualize target placement on the control screen. Action Target’s Live Fire Virtual allows shooters to fire at projected virtual targets with live ammunition. At SHOT Show, Action target will provide booth visitors with laser guns to experience this advanced indoor range technology first-hand. Shooting games such as “Ocean Battle” will also be included so that visitors may enjoy some friendly competition with other shooters. The BCS Deluxe 20 is a bullet collection system that integrates with the deceleration chambers of Action Target’s Total Containment Trap™. The system utilizes a discharge hopper that funnels bullet fragments from the deceleration chamber into 20-gallon drums. The drums, are situated on heavy-duty dollies for easy replacement, connect to the discharge hopper by means of quick-disconnect lid clamps. Additionally, a sight window incorporated in the drum lid allows range personnel to monitor the lead fill level inside the drum. Bullets emit a significant amount of lead dust. Adding the DCU to the Total Containment Trap™ removes this dust from the deceleration chamber and collects it for easy recycling. Action Target’s partnership with Camfil provides shooting ranges with premium DCUs, DCU filters and HVAC filters. 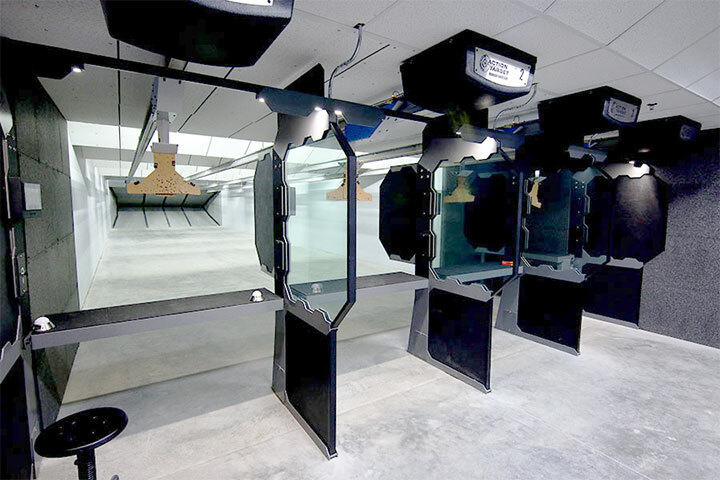 The American Series Shooting Stall provides shooting ranges with the unparalleled ability to customize their range. These extra-deep stalls have built-in muzzle blast barriers, integrated lighting and floor-to-ceiling walls to provide shooters with a comfortable atmosphere that is unrivaled in the industry. Customers may choose from one of our standard designs or customize every element of the stall to match their range’s design and needs. An Action Target interior decorator is available to assist ranges with their selections. “Ranges are constantly looking for ways to set themselves apart in today’s competitive market. With the American Series Shooting Stall, ranges can now customize every aspect of their stalls, providing shooters with a unique, luxurious and comfortable environment,” said Jesse Nelson, Product Marketing Manager at Action Target. Action Target’s DRM Pro is a dual running target system that was created to exceed the training standards for law enforcement and professional shooters. This system allows trainers to replicate real-worlds scenarios through unprecedented precision control, acceleration, and speed (ranging from 2 and 20 feet per second). The system may be accessed and operated from a tablet, smart phone or PC. The user interface displays real-time validation of speed and track position. PROVO, Utah – January 14, 2019 – Action Target Inc., the leading manufacturer of modern shooting ranges, steel targets and shooting supplies, is excited to announce the launch of Genesis™, the most advanced target retriever for indoor gun ranges. Developed by Action Target to reduce range maintenance, streamline system control and revolutionize the shooter’s experience, Genesis’s leading-edge technology has placed the new target retriever system in a league of its own. Among the technological highlights of Genesis is its integration with Action Target’s Strike Watch™. The patent-pending software actively monitors the target retriever and detects bullet strikes to the target carrier. In the event the carrier is struck, Strike Watch™ provides warnings and ultimately revokes usage, thereby protecting the range owner’s investment. Genesis also integrates with Action Target’s new range control system SmartRange Axis™. 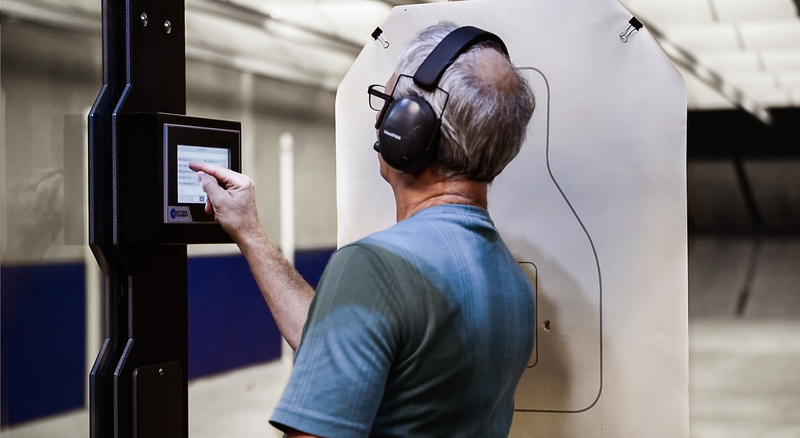 This allows ranges to apply unique shooting program and equipment permissions to each lane, create and store shooting programs, manage lane rental time and run synchronized trainings across multiple lanes. SmartRange Axis connects directly with the Action Target cloud network, which enhances business operations by allowing for remote system updates, troubleshooting diagnostics and real-time data. The design of the Genesis target carrier, which is both wireless and encased in heavy-duty armor, also ensures improved performance and reduced maintenance. In addition, the target clamp is recessed into the body of the carrier to avoid damage from bullet strikes and consequent costly repairs. Action Target placed significant emphasis on enhancing the shooter’s experience when designing Genesis. For example, an integrated camera displays the down range target on the shooter’s control screen, eliminating the need to bring the target up range to assess bullet hit locations. To assist with the development of the shooter’s proficiencies, the target has a 360-degree turning ability that allows for dynamic target presentations, including teasing, spinning and timed exposures. Furthermore, multiple lighting options and variable target carrier speeds (up to 15 feet per second) allow for a highly customizable training environment. Genesis is also pre-loaded with a large selection of challenging programs for basic, intermediate, advanced and professional shooters. When developing these programs and the user interface, Action Target incorporated extensive feedback from shooters of all skill levels to guarantee optimal satisfaction and ease-of-use. “The launch of Genesis is a monumental step forward in revolutionizing the shooter’s experience. From beginners to experienced law enforcement personnel, Genesis engages, challenges and thrills users of all levels. Our state-of-the-art technology also provides range owners with data that allows them to optimize range operations and strengthen customer interaction,” said Kevin Tomaszewski, VP of Marketing and Engineering at Action Target. PROVO, UTAH – September 4, 2018 – Action Target Inc., the leading manufacturer of modern shooting ranges, steel targets and shooting supplies, has announced the launch of Game Series paper targets, which bring an added element of competition and entertainment to target shooting. Inspired by arcade games, wildlife hunting, carnival entertainment, tabletop gaming and team sports such as hockey and baseball, the new Game Series paper targets create a riveting and interactive shooting experience. The target designs are vibrant and nostalgic to appeal to the shooter’s sense of amusement. Various targets, such as ‘Alien Invasion’ and ‘Anatomy Training’, employ fluorescent colors, allowing ranges to amplify the game experience through the incorporation of black lights. Each target includes unofficial rules for game play. The object of the ‘Ocean Battle’ target, for example, is to be the first player to sink his or her opponents’ ships by shooting the target rings on the ships. The rules suggest that each player is given 3 shots per round. “Range owners are always looking for opportunities to make shooting more exciting and engaging. The Game Series paper targets promote participation and competition among guests while they hone their shooting skills. The selection of games is also impressive: From ‘Billiards’ to ‘Big-O-Hunt’ and from ‘Clown-Shoot’ to ‘Croquet’, there’s something for everyone,” said Joseph Panasiewicz, Product Marketing Manager at Action Target. 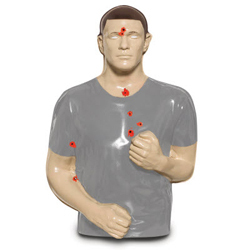 Learn more about Game Series paper targets at Shop.ActionTarget.com. ACTION TARGET ANNOUNCES INNOVATIVE NEW EVERYDAY CARRY STEEL TARGET, THE PT SCOUT. EVERYDAY CARRY STEEL TARGET, THE PT SCOUT. 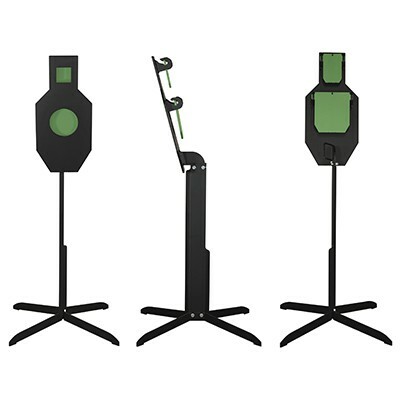 PROVO, Utah – May 3, 2018 – Action Target INC., the leading manufacturer of modern shooting ranges and innovative target systems has announced the release of a tool-free target system designed to utilize a 2×4, ring louder, maximize portability and allow for predictable splatter patterns. 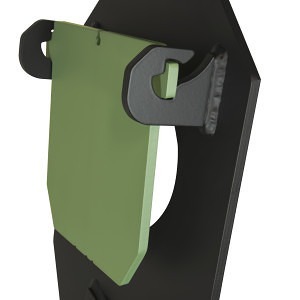 The PT Scout is Action Target’s first steel target that utilizes a 2×4. 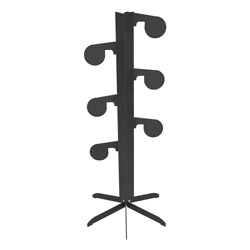 This innovative steel target stand can quickly collapse and locks together for easy storage and transport. Because it can break down into such a small profile and weighs as much as a gallon of milk, it allows for maximum portability for every shooter. “When developing The PT Scout, the three main goals were that it would ring louder, be more portable, and be more safe for shooters to use than all other targets that are offered today, we accomplished each of our goals,” Chris Hess, Product Marketing Manager, Action Target. PROVO, UTAH – July 31, 2017 – Action Target INC., the leading manufacturer of modern shooting ranges and steel targets for versatile firearms training, has announced the instructors for its Law Enforcement Training Camp in September. The 2017 lineup features trainers from Sig Sauer Academy, Smith and Wesson, Springfield Armory, Team One Network, Khyber Training, and Tactical Performance Center. 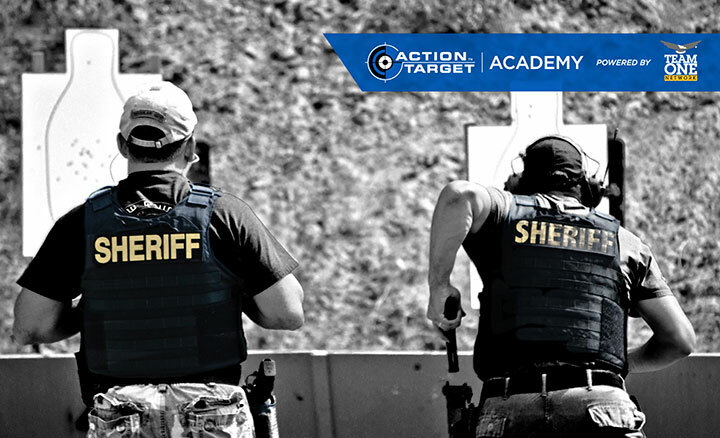 For over 20 years, Action Target has invited world class instructors to provide comprehensive training to law enforcement officers at the distinguished Law Enforcement Training Camp (LETC). LETC offers advanced and relevant training to equip participants with the skills necessary to take their department or agency to the next level in training. Performing Under Pressure with Ron Avery of Tactical Performance Center. Training without stress and pressure is the definition of complacent training. Avery is the Director of Training and co-founder of the Tactical Performance Center. As a professional trainer and martial artist Ron has combined his studies of the science of performance and shooting with other martial, tactical, and competitive disciplines. With 13 years of experience as a police officer and deputy sheriff he was a lead instructor for firearms, hand-to-hand skills, arrest control, and officer survival. His skill and experience, combined with his methodology and ability to deliver top-level training have made him an internationally recognized trainer. LE Bullets & Vehicles with Jonathan Carlson of Sig Sauer Academy. This course covers the dynamics of shooting from inside a vehicle, shooting from a moving vehicle and through windshield glass, as well as defensive vehicle use and cover. Students learn to use an LE vehicle to the maximum advantage – shooting through it, under it, and around it. Carlson’s resume includes a unique blend of experience from over 12 years in both military and law enforcement tactical operations. At the conclusion of Jon’s military service with the 5th Special Forces Group (Airborne) he continued to advance his skill set as a police officer earning certifications in Firearms, Use of Force, Defensive Tactics, Active Shooter, and First Responder. Jon Carlson is currently an instructor with the elite Sig Sauer Academy. Reality Based Force on Force Program Development with Dr. Wes Doss of Khyber Training. In this dynamic and interactive program, students will work to take training to the next level, build psychological, physiological and situational control skills effectively and efficiently in actual engagements considering real-world scenarios that unfold quickly. Force on Force Diminished Light Instructor Workshop with Dr. Wes Doss is a hands-on interactive workshop designed for the instructor that requires an enhanced knowledge of the application of diminished light techniques in conjunction with the use of a handgun in critical, real world situations. Doss is an internationally recognized firearm, tactics and use of force instructor with over 30 years of military & civilian criminal justice experience, as well as significant operational time with both military & law enforcement tactical operations & protective service organizations. Wes holds specialized instructor certifications from the U.S. Army, the U.S. Marine Corps, Arizona POST, the Smith & Wesson Academy, the Sig Sauer Academy, NRA LEAD, FEMA and the Department of State. Wes holds a Master’s degree in criminal Justice Administration and an upper level Doctorate in Psychology, with an emphasis on sports and performance psychology. Reactive Shooting with Todd Haller of Snowmass PD. Shooting on the reactive steel bobber range will push your skills to the limit. This course will demonstrate that a properly prepared officer can execute accurate shots in exceptionally short time windows including less than one second. Haller is a Patrol Sargent with the Snowmass Village Police Department (22 years). He is the training director of a regional multi-agency law enforcement firearms/Use of Force/arrest control/driving training program for agencies in south central Colorado. Todd is the lead POST firearms instructor for the Colorado Law Enforcement Training Academy (CLETA) at Colorado Mountain College, Glenwood Springs, CO. His firearms instructional skills and knowledge are in demand nationwide. Todd has taught basic to advanced handgun skills for Executive Security International, Safariland Shooting School, and the Action Target Law Enforcement Training Camp. Dynamic Use of Target Systems with Neil Honkala of Team One Network. This course will provide a series of dynamic training exercises that will help you improve your live fire training program. We will be incorporating a variety of target options that provide a pathway to improve the skills of your students. Honkala is a 26-year law enforcement veteran. Neil spent most of his career in south Florida as a SWAT team member, sniper, entry team member, and team leader. Neil was a state-certified firearms trainer and holds instructor certifications in pistol, shotgun, sub-gun, carbine and other SWAT/Tactical related disciplines. He has served as a road patrol officer, field training officer, tactical patrol force (street crimes) officer and undercover narcotics agent as well as supervising the tactical patrol force and K9 unit. Rapid Deployment Patrol Rifle with Steve Horsman of Springfield Armory. The patrol rifle has become almost universally accepted in the world of law enforcement. This course will show you how you can get your rifle into action faster, and more accurately to stop a threat immediately. Horsman is a 27-year veteran of the Tempe, AZ PD including 10 years as a SWAT Sniper. 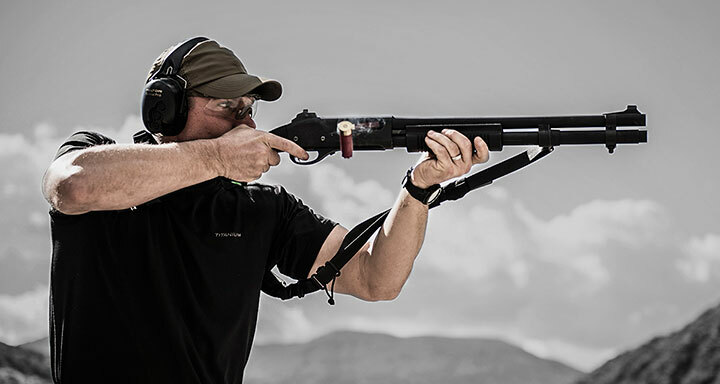 Steve is a FTU instructor, USPSA/IDPA/NRA competitor for over 20 years, and one of the authors of the TPD Patrol Rifle Program which has been adopted by numerous agencies. Shoot and Move with Kyle Schmidt of Tempe PD. Kyle’s class is 100% about building pistol shooting skills. This is not a philosophical class about tactics, it is a class about results on the target. Kyle combines his Law Enforcement training with his competitive shooting experience to provide a blend of instruction that is both practical and competitive. Schmidt is an officer with the Tempe, AZ Police department with over 18 years of experience including seven years on SWAT. He is a firearms SME and is currently a full time agency firearms training officer. Kyle competes in several shooting disciplines to include USPSA, IDPA, Multigun, NRA Bianchi Cup, NRA Bullseye, and NRA PPC. Has earned several National and World Champion titles through his competitive shooting career. Advanced Pistol Clinic with Brandon Wright of Smith and Wesson. In this class, Brandon gives you the skills to take your shooting abilities to the next level by mastering the fundamentals. He takes a realistic approach to a Police Officers performance in a police shooting and gives you skills and techniques to close the gap between speed and accuracy. Wright comes to LETC as a seasoned firearms and tactical operations instructor with a results oriented, hands on approach. With over 10 years of Law Enforcement experience with the James City County and Virginia State Police Departments, Brandon is a Master Instructor and conducts advanced level firearms and tactical training for senior firearms instructors and tactical teams. Brandon is also an accomplished professional shooter and currently represents Team Smith & Wesson. 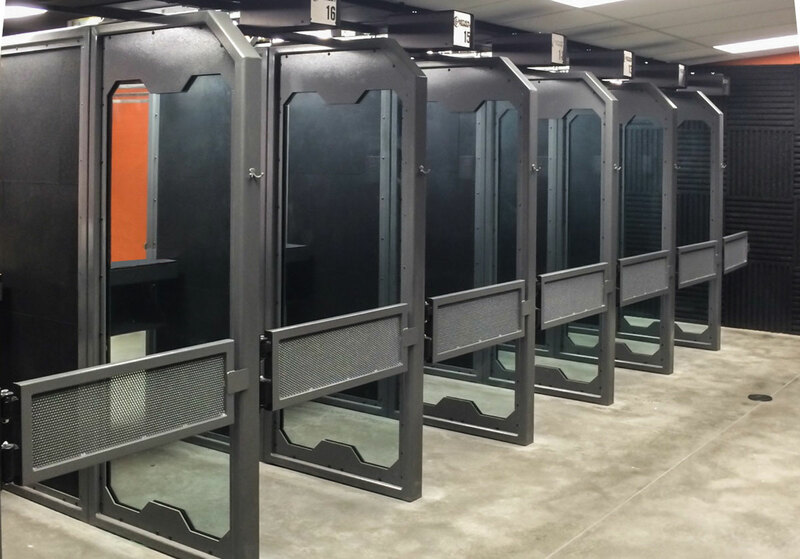 PROVO, UTAH – June 6, 2017 – Action Target INC., the leading manufacturer of modern shooting ranges, has announced the addition of shooting range ventilation installation and service. Action Target provides the industry’s best ventilation systems for both new range installations and existing ranges that exceed NIOSH, EPA, and OSHA air quality and other environmental standards. Action Target installs and services both Recirculating and Purge Ventilation Systems. A Recirculating Ventilation System reuses air from the range after filtering to ensure that reintroduced air is clean. Because this system uses air that is already cooled or heated, these systems require less energy to function. 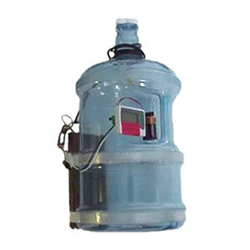 A Purge Ventilation System draws air from the atmosphere, introduces it into the range, filters the air and then releases cleaned air back into the atmosphere. Both of these ventilation systems can be customized to best fit the needs of any indoor gun range. Action Target provides a complete package of controls, air filters, and maintenance to keep employees, customers, and the surrounding area protected from the health concerns associated with lead exposure and other air-borne toxins found in indoor ranges. One of the most important elements of proper range ventilation is the filtration. Action Target has tested and evaluated different filtration options and offers the best filter solution for shooting ranges. These filters are also available to customers at Shop.ActionTarget.com. Action Target Inc. is a privately owned business headquartered in Provo, Utah. As a world leader in modern shooting range technology with more than 4,000 products and 40 patents for the systems it designs and manufacturers, Action Target has installed thousands of shooting ranges across the United States and in 25 other countries around the world. Action Target also designs systems and conducts firearms training for law enforcement and various military divisions. For more information on Action Target, visit www.ActionTarget.com. To learn more about Action Target products or to purchase items online, visit www.Shop.ActionTarget.com. PROVO, Utah – Action Target Inc., the leading manufacturer of modern shooting ranges, today announced Dr. Wes Doss, PhD as the keynote speaker for the 2016 Law Enforcement Training Camp in Provo, Utah on September 12 – 16. "Breaking The Paradigm" will be the title of Wes’ presentation, which will focus on use of force. Click here for course descriptions and guest instructors. Click here to register for LETC 2016. With the growing vilification of law enforcement and a steep increase in violent assaults on officers, effective and applicable training has never been so essential. Drawing on experiences gathered from training thousands of students and agencies around the world, Doss will discuss how to prepare officers for the current environment. This presentation will encourage participants to step outside the status quo, revise training methods and empower them to bring about positive change. Wes Doss is an internationally recognized firearms, tactics, and use of force instructor with over 30 years’ experience in military and civilian criminal justice. He has specialized instructor certifications from the U.S. Army, U.S. Marine Corps, Arizona POST, Smith & Wesson Academy, Sigarms Academy, NRA LEAD, FEMA and the Department of State. Doss holds a Master’s degree in Criminal Justice Administration and a PhD in Psychology with an emphasis on sports and performance psychology. He also has a broad background in martial arts and has taught full contact fighting for over 25 years. Doss is also a published author of the bestselling books Train to Win, and Condition to Win. 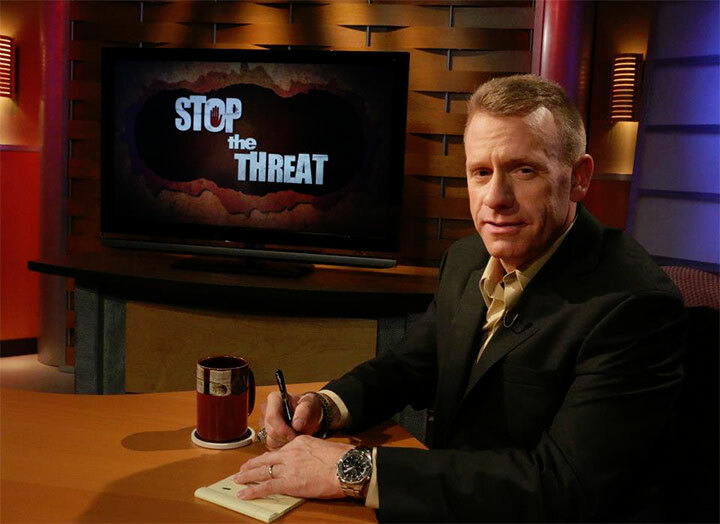 He has written numerous articles that have been featured in publications such as American Handgunner, American Cop, Police Magazine, Law Officer, SWAT Magazine, ASLET – The Trainer, and NTOA – Tactical Edge. Action Target Inc. is a privately owned business headquartered in Provo, Utah. The US market leader for shooting range technology, Action Target’s key markets include commercial, law enforcement and military. With over 4,000 products and 47 patents for the systems it designs and manufactures, Action Target differentiates itself from its competitors with its unique start-to-finish approach from engineering and manufacturing to range design and installation. Action Target also designs ventilation systems and conducts firearms training for law enforcement and various military divisions. For more information, visit www.actiontarget.com. 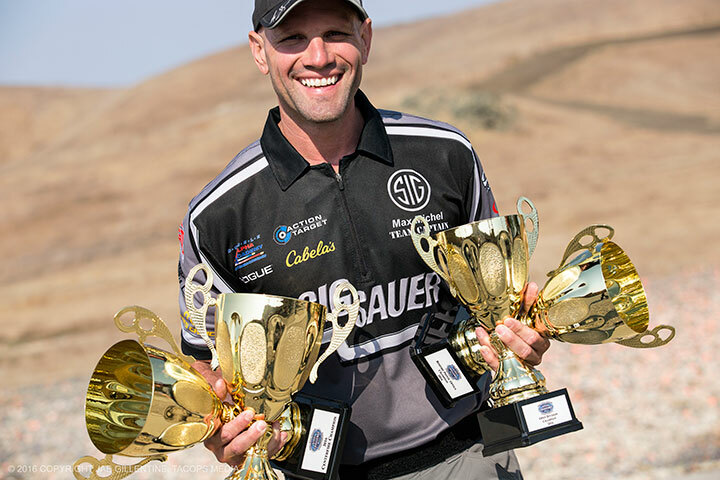 PROVO, Utah – Action Target Inc., the leading manufacturer of modern shooting ranges, congratulates Max Michel on winning the championship title and “Steel Master” of the World Speed Shooting Championship (WSSC) Steel Challenge on August 25-27 in San Luis Obispo, California. "I am blessed and honored to be here," said Max. "I was happy to bring home a win for my newest sponsor Action Target as well as my other sponsors and supporters." Max Michel is the only shooter to hold seven WSSC titles, having won the last four consecutive years. At this year’s competition, Max set a new world record with an overall score of 74.84, which included a new world record on the final stage (Outer Limits) of the match to secure the win. Max now owns the overall course world record and seven (of eight) stage world records. "We had a great time watching Max set a new world record this year. It is an honor to have Max representing our brand in such an impressive way. Max’s dominating performance portrays the excellence that is valued by Action Target in everything we do," said Kevin Tomaszewski, Action Target’s Vice President of Marketing and Engineering. The WSSC Steel Challenge is comprised of eight shooting stages, each hosting five targets. Participants compete to hit all five targets in the fastest time. Each competitor utilizes three different firearms to shoot in three divisions of fire. Max Michel will compete next at the Area 4 Championship in Rosenberg, Texas on September 8 – 10, followed by the IPSC Nationals in Frostproof, Florida on September 16 – 18. 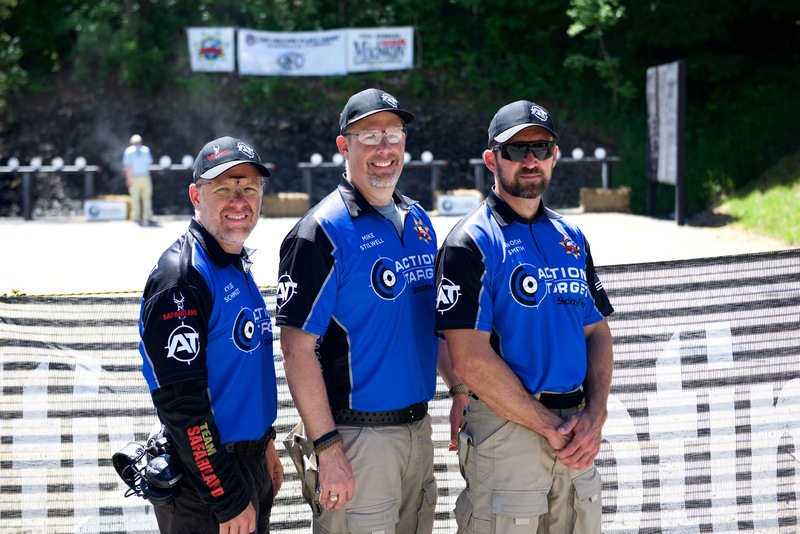 PROVO, Utah – Action Target Inc., the leading manufacturer of shooting ranges, congratulates Enoch Smith, Kyle Schmidt, and Mike Stilwell of the Action Target Shooting Team, on their recent accomplishments at the 2016 NRA Bianchi Cup presented by MidwayUSA. Kyle Schmidt joined one of the most elite clubs in all of action shooting, as he completed the match with a perfect 1920 score. This amazing score has only been achieved by 24 other shooters in the history of the Bianchi Cup. In addition to achieving a perfect 1920 score, Kyle Schmidt also received the High Law Enforcement Award, first place in the Open Falling Plate Rack Event, first place in the Open Barricade Event, and second place in the Open Moving Target Event. Enoch Smith also had a great match taking home many titles including: first place in the Metallic Practical Event, second place in the Metallic Falling Plate Event, and second place in the Metallic Barricade Event. The relationship between Action Target and the Bianchi Cup stated over 20 years ago when Action Target installed new target systems for the match. Since then, Action Target has been the official target sponsor of the match and provides all the target systems used in the match. Action Target congratulates all participants and their accomplishments at the Bianchi Cup and looks forward to seeing everyone again next year. PROVO, Utah – Action Target Inc., the leading manufacturer of shooting ranges, today announces the opening of registration for their highly anticipated annual Law Enforcement Training Camp (LETC), which will be held September 12-16, 2016. 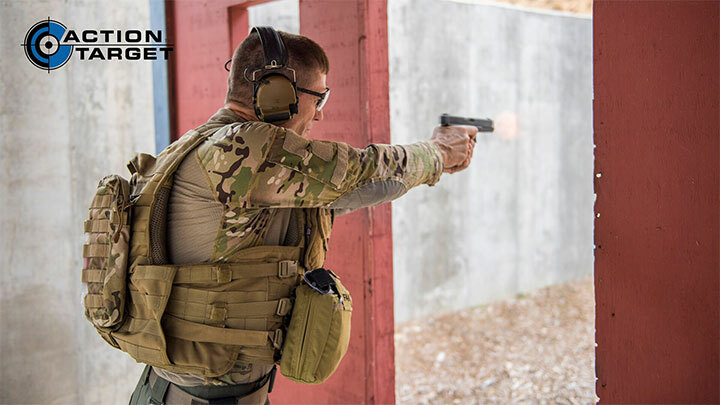 Now in its 24th year, LETC brings world-class instructors and a superior training curriculum to over 140 firearms trainers at a week-long, fast paced, high volume shooting camp. LETC is designed to aid firearms instructors from across the country in their training effectiveness allowing them to pass those skills along to officers in their respective agencies. "LETC is a way for Action Target to give back to the LE community. It is extremely rewarding to hear the high praise and positive feedback from LETC attendees each year. LETC intensifies our commitment to continuously improve our training programs and products," said Kevin Tomaszewski Action Target V.P. of Engineering and Marketing. LETC instructors are some of the best in the industry. Instructors are hand picked from some of the most respected training institutions in the world and courses are chosen and developed to address the current needs of modern law enforcement agencies. "What separates LETC from other schools and courses is the depth of skill, knowledge, and passion for learning and teaching that comes together each year at LETC" said Seth Ercanbrack, Marketing Communications Manager at Action Target. With new and improved course curriculums and the introduction of vendor demonstrations, this year promises to be better than ever. The range at LETC is equipped with the latest advanced target systems by Action Target allowing participants to train on world class facilities including a shoot house, reactive steel bobber range, turning targets, runners, and the worlds best portable steel targets. LETC has built a long-standing reputation for great training, great people, great food, and the best value anywhere. Participants will also have the opportunity to put their skills to the test in the annual Cory Wride Memorial Match for a chance to win prizes and bragging rights. 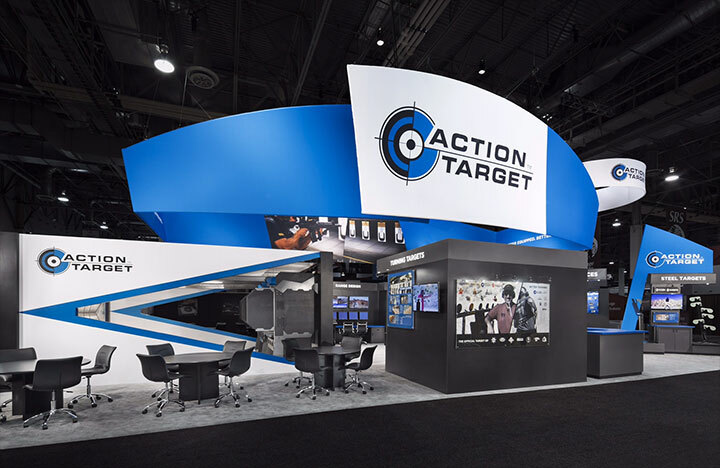 PROVO, Utah – Action Target Inc., the leading manufacturer of shooting ranges, today announces its release of the Sentry™ Stall: a new stall design for indoor shooting ranges. The Sentry Stall, in addition to Action Target’s industry-leading Defender™ Stall, allows range owners to customize their ranges with an unparalleled selection of stall designs and options. 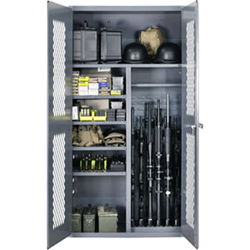 The Sentry Stall utilizes interchangeable ballistic panels that are available in both steel and glass. The panels, which are independently tested for ballistic integrity, are specifically designed to prevent bullet penetration and ricochet. The stall may be outfitted with optional accessories, including brass deflectors, custom colors, muzzle blast barriers and lighting to increase the shooter’s comfort. Several table options are also available: a fixed table with an optional storage shelf and a pivot table that rotates out of the way for easy downrange access. 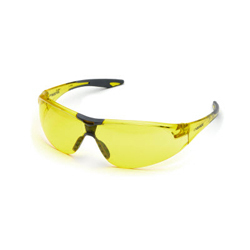 “Action Target takes pride in leading the industry in safety, design and functionality. The Sentry Stall is a testament to Action Target’s commitment to providing customers with the best products and options available,” said Jesse Nelson, an Action Target Product Marketing Manager. The Sentry Stall is also offered in a deluxe version, which is twice as deep. The added depth, along with an optional self-closing gate, provides shooters with the optimal private shooting experience. Action Target has added an assortment of new color options for the Sentry Stall and Defender Stall frames and ballistic panels. The variety of color choices gives customers the opportunity to add a unique look and feel to their ranges. The AWD Pro gives shooters a whole new experience of improving their shooting skills while having a good time, making it the reason ranges with the AWD Pro will become the go to destination. To learn more about the AWD Pro visit link: www.actiontarget.com/products/awd_pro/ . PROVO, Utah – Action Target Inc., the leading manufacturer of shooting ranges, today announced their collaboration with Team One Network. Together the partners have developed the Action Target Academy to provide advanced training courses for range masters, firearms instructors, shoot house instructors, range safety officers and citizens around the world. Action Target has a start-to-finish approach to shooting range development, from product engineering and manufacturing to range design and installation. 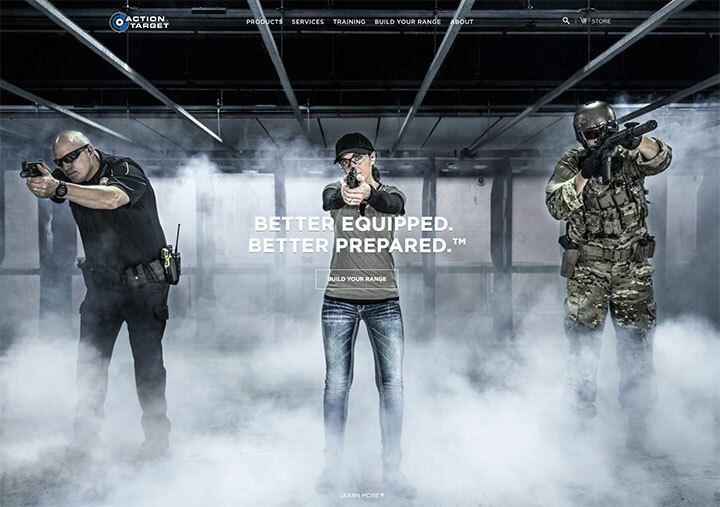 The Action Target Academy allows the Company to amplify their turnkey operations by delivering world-class training to law enforcement, military and commercial ranges. "Training has always been an important part of our commitment to providing an all-inclusive solution for our clients. Our partnership with Team One Network gives us the opportunity to integrate the industry’s best in firearms training, targets and shooting range products," said Kevin Tomaszweski, Action Target’s Vice President of Engineering and Marketing. The Action Target Academy powered by Team One Network is comprised of an extensive selection of courses. All course material is designed to educate participants in modern training tactics using updated range and target technology. "We are honored that Action Target has selected Team One Network to provide training programs for the Action Target Academy," said John Meyer, President of Team One Network. "Aligning with Action Target allows Team One Network to instruct on the most advanced shooting ranges and target systems available. Combining these systems with the most up-to-date and technologically advanced training from Team One Network delivers a high quality and unique training program." Team One Network has the ability to bring Action Target Academy courses to any location for group or department trainings. They also welcome individuals to attend scheduled events across the country. To find out more about the Action Target Academy powered by Team One Network, including course details, visit: https://www.actiontarget.com/training/action-target-academy/. Action Target Inc. is a privately owned business headquartered in Provo, Utah. The US market leader for shooting range technology, Action Target’s key markets include commercial, law enforcement and military. With over 4,000 products and 40 patents for the systems it designs and manufactures, Action Target differentiates itself from its competitors with its unique start-to-finish approach from engineering and manufacturing to range design and installation. Action Target also designs systems and conducts firearms training for law enforcement and various military divisions. For more information, visit www.actiontarget.com. Team One Network is dedicated to providing law enforcement, military and commercial ranges with the most current and technologically advanced training courses available. Team One Network’s professional instructors and consultants are recognized as subject matter experts both nationally and internationally. To learn more, visit www.teamonenetwork.com. PROVO, Utah – Action Target Inc. ("Action Target") and Triple Curl Public Relations and Advertising ("Triple Curl") are key contributors to SHOT Show Industry Day at the Range ("Industry Day"). The partnership has had a major role in initiating and growing the event. With its origin as a media showcase for Triple Curl’s clients, the event initially hosted 15 gun manufacturers. Industry Day, which is open to all gun companies, now hosts over 90 exhibitors. Action Target has offered substantial support from the beginning. "As a company we believe that this is one of the most significant shows in the shooting industry. Action Target is a proud sponsor of Industry day at the Range and couldn’t be happier to be a partner again this year," said Kevin Tomaszewski, Action Target’s Vice President of Engineering and Marketing. Providing participants with a safe and engaging shooting environment is of primary importance to any shooting event. For over 12 years Action Target has outfitted Industry Day with the safest, most durable portable targets on the market, giving gun makers the opportunity to securely and efficiently demonstrate their merchandise. "I am very lucky to have Action Target as a partner for the past 12 years," said Cory Cannon, Owner of Triple Curl. "The reason Industry Day at the Range is the chief shooting event in the world for gun dealers and the media is because of the partnership our firm has with Action Target." 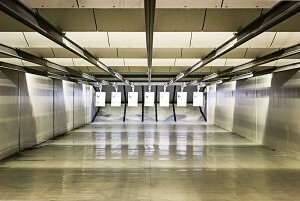 The flexibility of Action Target’s shooting systems has also made it possible for the venue to accommodate rifle, shotgun, handgun and archery shooting. Bringing these disciplines in one centralized location allows the media and dealers to shoot together. "We have come a long way together and, as a result, both Triple Curl and Action Target have grown in the industry," Cannon said. "Every time I see Action Target’s impressive, state-of-the-art facility, I remember the early years and feel proud to be a part of it." PROVO, UT — Action Target Inc. (booth #14568), the Global Leader in Shooting Ranges (Development, Equipment, Services) today announced new products to be showcased at the NSSF’s annual Shooting, Hunting, Outdoor Trade Show (SHOT Show) in Las Vegas, Nevada. Custom Color Options for Stalls: New to the shooting range industry, custom color options for stalls will now allow range owners to create a more custom range that fits with their brand. New Shooting Stalls: Action Target is excited to launch several new stall designs that will provide ranges more options in 2016. From enhanced privacy to customizable features and economical options, Action Target continues to be the leading provider of high-quality range equipment. Dual Running Man ProTM: Built for moving-target training, this system can accelerate faster than a linebacker and can surpass speeds of the world’s fastest Olympic athletes. New features also include numerous state-of-the-art controls for wireless range integration and a precision position system accurate to .001m. MATCHTM: The standard in live fire shoot house technology for more than 20 years has added new accessories and advanced design. A full size room showcasing new fascia options and updated features will be available to walk through. TAC HouseTM: The new Training Ammunition Combat (TAC) House is a modular, easy to reconfigure realistic training environment. It uses non-ballistic interlocking panels that are quickly assembled for numerous configurations. This system is designed for indoor and outdoor use with paint marking simulated ammunition. A house demo will be available for walk through at the booth. Portable Bullet Trap: As an accessory for your shoot house, this trap comes with new patent-pending designs that allow for reliable and safe collection of bullets fired into it. With an easy-to-use drop tray, fragments can be conveniently emptied into a container for recycling. New castor wheels with an innovative brass guard make moving the trap within the house smooth and safe. The trap uses a crumb rubber fascia and a ½ inch AR500 smash plate. User Interface: A revolution in the target retriever world, this new interface offers a more engaging and user friendly system that brings advanced features of the AWD to life. The new interface comes preloaded with games and drills developed by leading firearms trainers that will push any level of shooter and keep them coming back for more. Barrel Fill Sensors: This improvement to the screw conveyor system includes a service monitor to inform when the barrel is full and needs to be replaced. NSSF’s annual Shooting, Hunting, Outdoor Trade Show (SHOT Show) is the largest and most comprehensive trade show for all professionals involved with the shooting sports, hunting and law enforcement industries. It is the world’s premier exposition of combined firearms, ammunition, law enforcement, cutlery, outdoor apparel, optics and related products and services. The SHOT Show attracts buyers from all 50 states and more than 100 countries. The show is owned and sponsored by NSSF and is produced and managed by ConvExx. Visit the show online at www.shotshow.org. 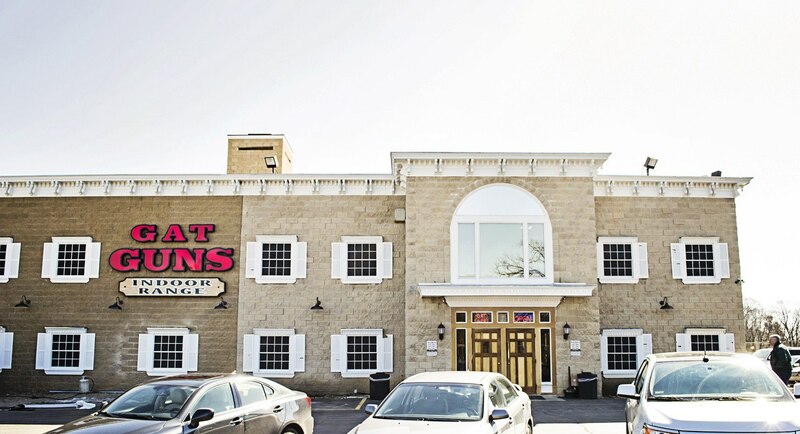 PROVO, Utah — Action Target, Inc. (ATI) officially congratulates Badlands Pawn "Guns, Gold & Rock N Roll" theme park in Sioux Falls, SD on the opening of their new Action Target indoor shooting range. On Thanksgiving Day, Badlands Pawn opened their new unique facility including a pawn shop, concert stage, tattoo shop, deli, radio station and gun range. The new range, which was designed and installed by ATI, consists of two bays: the first bay includes ten public lanes and the second bay consists of four exclusive lanes for an elite experience. Both bays are 25 yards long and are rated for handgun and rifle calibers. The range also incorporates ATI’s steel Total Containment Trap, screw conveyor system, dust collection unit, and ATI range ventilation. The public lanes utilize toggle retrievers, which is a user-friendly design for shooters of all levels. For a more immersive experience, the VIP lanes in the second bay are equipped with Mancom Touch Plus target retrievers with backlit LCD displays, advanced turning functions, and programmable training scenarios. To enhance the shooter’s experience, Badlands rents and sells firearms. Their large inventory ranges from handguns to fully automatic rifles, which can all be tested on their range. With the shooting range accompanying so many other attractions, Badlands has become a destination range for people all around the country. On opening day alone, hundreds of people walked through Badlands’ doors to participate in their new unique atmosphere and experience the Action Target shooting range. Range Consultant Scott DeSanti said, "It is fun to be involved in the amazing facility that Badlands has developed. Our products complement the exciting atmosphere and provides visitors with an amazing shooting experience." Taking steps beyond entertainment and retail, Badlands will be providing quality firearms education for their customers, starting with a course for South Dakota’s enhanced concealed carry permit. Badlands also plans to add additional courses over time to best accommodate their customers. The new shooting bays are now open to the public and may be used free of charge by Sioux Falls Police Department when lanes are available. Action Target Inc. is a privately owned business headquartered in Provo, Utah. As a world leader in shooting range technology and with more than 4,000 products and 40 patents for the systems it designs and manufactures, Action Target has installed thousands of shooting ranges across the United States and in 40 other countries around the world. Action Target also designs systems and conducts firearms training for law enforcement and various military divisions. For more information about Action Target, visit www.actiontarget.com. To learn more about Action Target products or to purchase items online, visit www.letargets.com. Badlands Pawn, Gold & Jewelry is located at 1600 W. Russell Street in Sioux Falls, South Dakota. It is open from 9 a.m. to 9 p.m. daily in the heart of the Sioux Falls Sports & Entertainment District. Admission is free. For more information, visit www.badlandspawn.com. 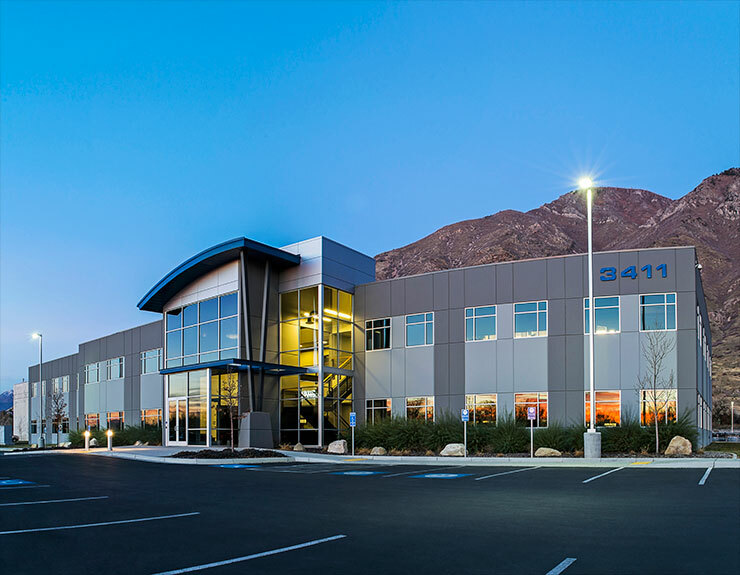 PROVO, Utah – November 20, 2015 – Action Target announced today that their Mancom Manufacturing Inc. facility is in the final stages of relocation from Ontario, Canada to Provo, UT. 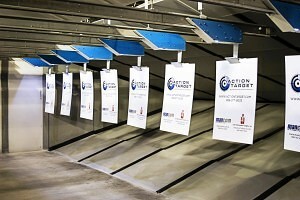 Mancom was acquired by Action Target in 2009 to complement its shooting range product offerings. The Mancom brand will continue to be recognized as the premier line of Action Target retrievers & target systems. The relocation of the Mancom facility to Action Target’s headquarters in Provo, UT brings improvements to the organization; Mancom products will now be manufactured, assembled, and shipped from the Provo, UT site, allowing Action Target the ability to leverage the resources and expertise of its world-class production facility and quality standards. To ensure a seamless transition of technology and future growth opportunities, Action Target has increased the number of personnel dedicated to Mancom products and has also retained the original Mancom engineering staff. With a centralized customer service department, full inventory of Mancom parts, and a dedicated Mancom customer service team, Action target is streamlined to better serve its customers. Products that will benefit from this transition include: the industry-leading All Wheel Drive target retriever, the Touch Plus target retriever, and the Touch ‘N’ Go target retriever; pneumatic and electric turning target stands; and the Dual Running Man target system. Action Target, Inc. is a privately owned business headquartered in Provo, Utah. As a world leader in shooting range technology, having more than 4,000 products and 40 patents for the systems it designs and manufactures, Action Target has installed thousands of shooting ranges across the United States as well as in 40 other countries around the world. Action Target also designs systems and conducts firearms training for law enforcement and various military divisions. For more information on Action Target, visit www.ActionTarget.com. To learn more about Action Target products or to purchase items online, visit www.LETargets.com. “We’re very proud of the LETC program and the opportunity it provides for Action Target to give back to the community. Each year we receive the highest accolades from attendees and supporters. LETC 2016 will bring new courses, better ammo purchasing and shipping opportunities, more vendors, and much more,” said Seth Ercanbrack, Marketing Communications Manager at Action Target. PROVO, Utah – Action Target has opened registration for their heavily anticipated annual Law Enforcement Training Camp (LETC), being held September 14-18, 2015. Now in its 23rd year, LETC brings over 140 firearms trainers from across the country and around the world together for a week of fast paced, world class training. Action Target designed this event to aid firearms instructors in their training effectiveness and skill, and to pass those skills along to officers in their respective agencies. “LETC is a way for Action Target to give back to the LE community. The high praise and positive feedback that we receive from LETC attendees each year intensifies our commitment to continuously improve our training programs and products,” said Seth Ercanbrack, Marketing Communications Manager at Action Target. With the addition of new course offerings and a new high-speed format, this year’s LETC promises to be better than ever. At the nightly competition participants have a chance to show their skill and compete to win prizes and bragging rights. LETC has built a long-standing reputation for great training, great people, great food, and the best value anywhere. “What separates LETC from the many schools and courses I’ve been a part of is the depth of skill, knowledge, and passion for learning and teaching that comes together each year at LETC,” said Michael Lehner, LETC Training Administrator. Agencies and trainers who would like to attend are encouraged to register quickly to ensure space is available in desired courses. Attendance is capped at 140 participants and sells out quickly each year. Course descriptions and registration info can be found at actiontarget.com/LETC. 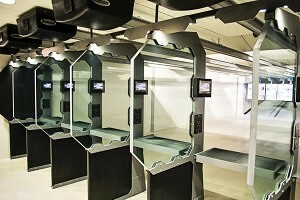 The new shooting bays include steel funnel bullet traps which safely collect and contain lead debris, bullet proof shooting stalls, an advanced Range Ventilation system and Mancom target retrievers that allow for complete control over target distance, lighting effects and 360 degree random edging from an LCD control screen in every booth.